Hull construction includes use of USA-made COOK® gel coat; Hand-laid fiberglass with Knytex® surface mats and CoreCell® coring above waterline; solid fiberglass lamination below the waterline; with blister-resistant vinylester resins used. Kevlar reinforced stem and stern bottom areas. Superstructure includes CoreCell® coring and surface mats for print-through reduction. 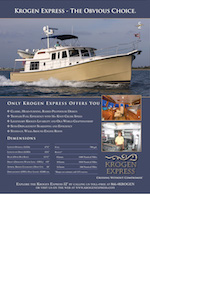 Teak aft and flybridge decks, fastener free. Boat, side, and fore decks have non-skid finish. Bulwark has molded plank lines with gel coat finish. Polyurethane formulate marine sealants used at hull-to-deck, boat deck joints, and exterior fittings. Transmissions: Kanzaki with 2.43:1 ratio. Raymarine® eS128 Hybridtouch multifunction radar, chartplotter/GPS and echo sounder. 2 on flybridge. Specifications and equipment are accurate at time of printing, however, are subject to change.